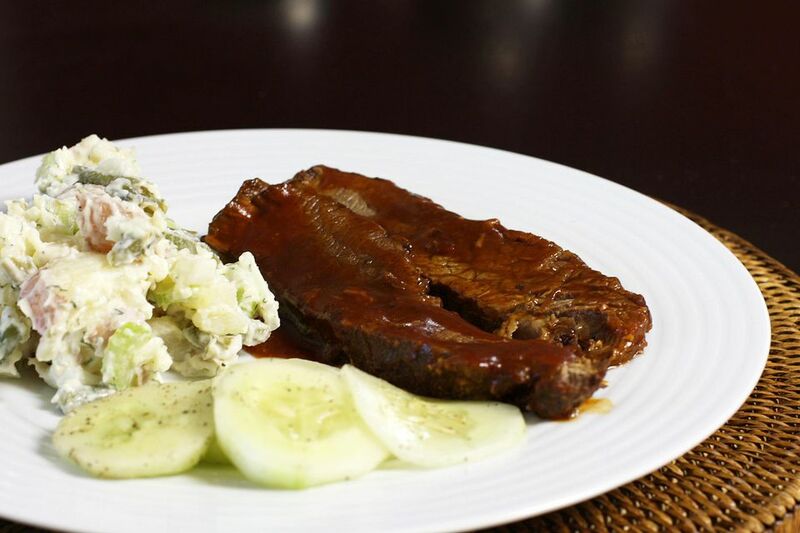 This is a tender and delicious oven barbecued beef brisket, delicious with a potato salad and sliced vegetables. Serve leftover brisket on toasted split buns. Line a baking dish or roasting pan with foil. Heat oven to 325°. Trim excess fat from the brisket. Combine the grill seasoning, chili powder, paprika, and pepper; rub all over the brisket. Place the brisket in the prepared baking dish and sprinkle the brown sugar over the top. Cover the dish tightly with foil and bake for 2 1/2 hours. Slice the brisket thinly and return to the baking dish. Combine the barbecue sauce and water and pour over the slices. Cover and continue baking for 1 hour longer, or until very tender.